Has it really been three years since we've had a Russell Allen (Symphony X) and Jorn Lande (Jorn, Masterplan) collaboration? Indeed. Two of the best vocalists in the melodic hard rock and heavy metal universes are back with their third project The Showdown. Again, guitar great and master composer Magnus Karlsson returns to direct and play on this disc. Artwork comes once more from Rodney Matthews (Magnum, ASIA etc.). Directly, this powerful trio of Allen, Lande, and Karlsson need little introduction. The music and performances are superior making The Showdown equal to, possibly better, than the first two outings. Were you expecting something different? Certainly there's a metal edge throughout, yet The Showdown probably is best considered as melodic hard rock. Songs like Never Again, Turn to Gold, Bloodlines, and the wonderful Copernicus have a groove laden rock style, fitting an arena. Yet, We Will Rise Again injects the epic feel of power metal into that same hard rock motif. Other songs, like The Artist or The Showdown can bump the knobs up with a heavier more metal feel. In the end, it's all quite powerful stuff proving once more Karlsson's brilliance as song writer and Allen and Lande's unequalled vocal mastery. Quite recommended. 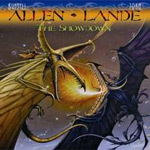 Allen/Lande's The Showdown is quite powerful stuff proving once more Karlsson's brilliance as song writer and Allen and Lande's unequalled vocal mastery.